Can South Dakota Handle The GOP's Healthcare Plan? support. Though likely to fail on this try, it’s bound to come up again. I can certainly understand our Governor Daugaard enthusiastically getting behind it. For one thing, the current bill renders moot South Dakota's stubbornly irrational rejection of Medicaid expansion, an offer under ACA that would provide a couple of billion bucks to our state over the next few years. Heck, the status quo is such a good deal that then-Governor Mike Pence figured out a way to expand Medicaid into Indiana, making him one of eleven Republican governors who understood the value of insuring a sizable portion of their state populations who make too much to qualify for Medicaid but not enough to afford conventional insurance. 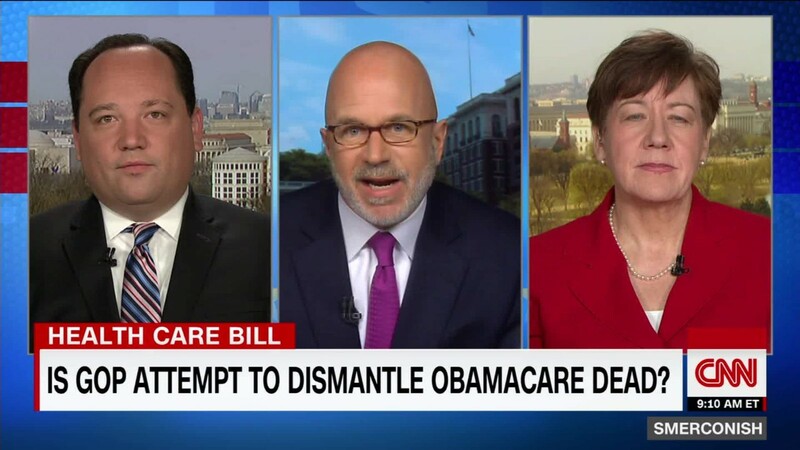 Adding in the economic gains from the rollover of those billions of dollars only reinforces the fiscal sanity of saying yes to expansion built into ACA. Daugaard himself had even come up with a plan to bring it into South Dakota, an effort he abandoned after he apparently was convinced that a Trump administration could easily overturn ACA. Trump's vision has of course been exposed as a hallucination, but Governor Daugaard is dutifully following up on his responsibilities and political affiliations by giving Republican leadership the attention and lip service it merits. His Chief of Staff and son-in-law Tony Venhuizen was quick to address the Medicaid expansion funding issue a few days ago, when he told the Mitchell Daily Republic that one of the main reasons Daugaard supports the latest GOP plan is that it brings "funding parity" between expansion and non-expansion states. This is actually a back-door way of acknowledging what has been obvious for years: states like South Dakota, stubborn as they've been in their resistance to Medicaid expansion, have really been getting the short-end of the stick when it comes to federal healthcare spending. But by going along with this concept of federal block granting, South Dakota effectively gains what it has been giving up by disdaining expansion. Block grant money would amount to a yearly gain of nearly $1 thousand per resident (almost a billion dollars) to South Dakota according to a New York Times analysis. That would more than make up for the money we've been leaving on the table up to now. And, as a business-type who sees the value of money pouring into the state, regardless of whether the source is named Obamacare or Trumpcare, I love the idea. The only caveat now is the matter of trust that began this missive. We've seen what's happened to federally-supported and sanctioned programs in this state during the past decade or so, and it hasn't been pretty. EB-5 and Gear-Up have set pretty poor examples of our current leadership's ability to manage Washington-sanctioned programs. Before the Daugaard administration gets totally wound up in its enthusiasm for this block grant or the next one that’s likely to be proposed, some assurances that another fiasco won’t materialize are in order. Last week's "invitation only" gathering organized by seven local Republican state legislators was a bizarre and embarrassing attempt at exclusion and avoidance of reality. It was also a microcosm of what is probably a growing divide in the GOP on all levels, from local to national. The seven local Pubs--Senators Haverly, Solano and Partridge and Representatives Johnson, McPherson, Tieszen and Conzet--took it on themselves to hold a public gathering that was limited to 107 invitees, of whom 40 showed up, meant to "hear nonpartisan ideas from local leaders about community and economic development." In a show of secrecy that would evoke admiring nods from autocratic societies everywhere, organizers wouldn't make the invitation list public, apparently taking it on themselves to covertly pick and choose who among their constituents in this area are capable of delivering nonpartisan ideas about public affairs. I get that the elected officials who staged this exercise in exclusion are (like me, on many an occasion) fed up with legislative time and resources devoted to controversial social issues. Transgender bathroom use and gun rights were singled out in the RCJ article about the meeting, but I have no doubt that other issues, like reproductive and religious rights, were probably considered off limits by organizer Johnson, who told the Journal that "we didn't want those controversial social issues to override the economic and community development issues that we wanted to talk about at this event." Well, doggone those "controversial social issues" anyway. Imagine the temerity of voters and taxpayers who think they should have a place at the table of an invitation-only gathering of elected officials and their hand-picked constituents. Just who do those social issue-oriented citizens think they are? Sarcasm aside, much as I empathize with the organizers of this event, their planning and execution of it are for the birds. I suppose that this is what you can expect from a party that has split. Like Republicans everywhere, the local GOP seems to be struggling with a collective identity crisis focused on its commitment to conservative values. The pragmatists like Johnson and his cohorts just can not insulate themselves against party ideologues (of whom Reps Lynn DiSanto and Taffy Howard were mentioned in the RCJ piece) who are identified with the "social issues" that this meeting sought to avoid. This is a rupture that Republicans have to contend with now that a sizable wing of the party claims its conservative values entitle the government to meddle in the private affairs of Americans, denying rights on the basis of personal behavior. I don't much care for that segment of the GOP myself, considering that public policy matters of some immense importance need all the time and attention that our elected officials can give to them. Many of these so-called "social issues" are a distraction, an annoyance and a pain for some of us, but the true believers who support them have their rights. Specifically excluding them or any voters from a public gathering of elected officials is about as un-American as anything I can think of. As to limiting invitees to a secret list of supportive voters? How elitist can these Republicans get? Democracy makes a lot of noise. Putting your hands over your ears is no way to make it go away. package that will help "middle class South Dakotans who are struggling to make ends meet." That's a nice enough sentiment, but while Thune's heart is in the right place, I'm not sure his head is following suit. In fact, Thune kept his bias against middle-class consumers out of his RCJ piece. In his website, he was recently praising the general thrust of his trickle-down tax reform philosophy by saying we "need to move our tax system more toward taxing consumption rather than savings and investment." 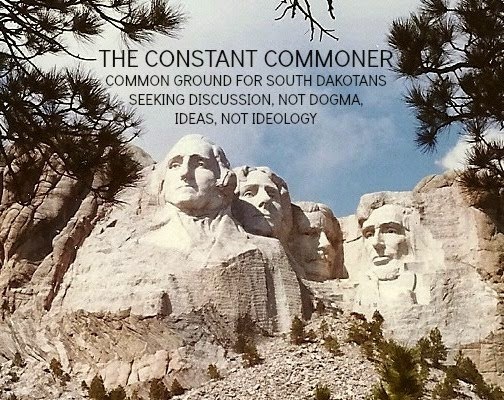 He then reveals a lack of interest or attention to his home state's constant struggle with that very tax policy by stating that "South Dakota is, of course, a great example of how to do this at the state level." Yes. "Of course." 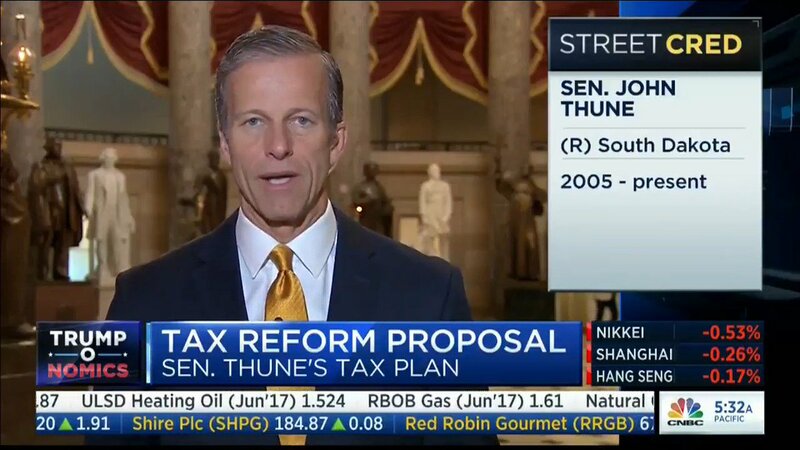 Thune's infatuation with our state's regressive tax structure is so complete that he now wants to inflict it on the rest of the country. Does the Senator understand that our reliance on sales taxes has led to a regular budget re-set derby among state government officials who've had to change projections twice during the past three years because sales tax receipts fell significantly short of expectations? This is what happens in a state where consumption (sales and gross receipts) taxes are the dominant source of revenues. South Dakota in 2015 got 82.4% of its state revenues from sales taxes, compared to a national average of 23.3%. And Thune calls South Dakota a "great example" of efficient taxation? Please. Meantime, when it comes to championing the economic interests of South Dakota's mid- to lower-income residents, Thune's proposal to focus on tax relief for savings and investments means virtually squat. In his RCJ piece, the senator notes that half the public lives paycheck to paycheck and that a third are $400 bucks away from a serious financial crisis. I doubt South Dakotans who fit that profile are cheering Thune's notion that a tax break for those who save and invest will make them better off. In his website's trickle-down polemic, Thune claims that Reagan-era tax cuts were responsible for the economy's bounce-back during the 1980s, completely ignoring that federal spending increased by 2.5% a year from 1981-1989. The federal debt during that era went from $997 billion to $2.85 trillion. Those who know something about John Maynard Keynes and his theories about government spending driving economic growth are sagely nodding their heads. We also wonder why trickle-down proponents never mention Reagan's ballooning deficits. I cheer the prospects for Thune's style of tax-cutting as lustily as any of my peers in the business community, but I also know that without consumers my business interests wouldn't amount to much. Consumer spending represents more than 70% of the American economy. Giving us business types some tax relief is indeed likely to drive more investment and capital spending, but to do so by "moving our tax system more toward taxing consumption rather than savings and investment" makes no sense. Thune needs to focus on those who spend, not on those who save. last week's Sioux Falls Argus Leader showcased the problems that our state's most powerful region of economic growth, the Sioux Falls metro area, is having with this. The construction trade in particular is finding it hard to fill its workforce needs because of a built-in language barrier that's written into our state's laws. Specifically, South Dakota's legal requirement that all government documents--including drivers license exams--be written in English is turning into an economic roadblock. The English-only law was adopted in 1995, apparently to save printing expenses, according to a retired legislator, Mel Olson, who helped push the bill through. Olson told the Argus Leader that there was "never any intention on prohibiting giving the driver's license test in other languages." Olson's deeper explanation--that the law's intent was to save the state money by blocking an effort to get official state reference guides printed in Lakota as well as English--has some questionable overtones, but regardless of the objective, the unintended consequence now poses a problem. This is a law that needs to be refined, if not altogether repealed. I have some background in this. My family came up through the immigration ranks (I was born in a refugee camp in Rome, Italy) of the post-WW II era. Nearly seventy years later I'm actually pretty glad that in our day we refugees seeking a new life here in the U.S. were by custom and circumstance totally immersed in English. By any standard we Tsitrians have done pretty well for ourselves and our communities, an outcome that I believe was energized and accelerated by our quick adoption of English as the language of our household. I wish that were the case for every immigrant in this country--but it isn't. And the fact that it isn't has come home to roost right here in South Dakota, where we have to grapple with the fact that English immersion for immigrants will probably never be a fact of our state's economic and cultural life again. Nostalgia for our historic character as a "melting pot" doesn't get the job of building our economy done, as a lot of South Dakota enterprises are finding out. In Sioux Falls, the head of the local chapter of the Associated General Contractors tells the Argus Leader that immigrant labor is "hugely important" to the construction trade, a fact that anybody in the Black Hills who's had a roof installed in recent years knows first hand. I've put up three roofs, two commercial and one residential, in the past four years and I'm pretty sure that each crew was close to 100% Spanish-speaking, with only the lead installer capable of communicating in a halting version of English on each job. I doubt that roofing and other contractors here would have much luck putting adequate work crews together without Spanish-only speakers making up a good share of the workforce. 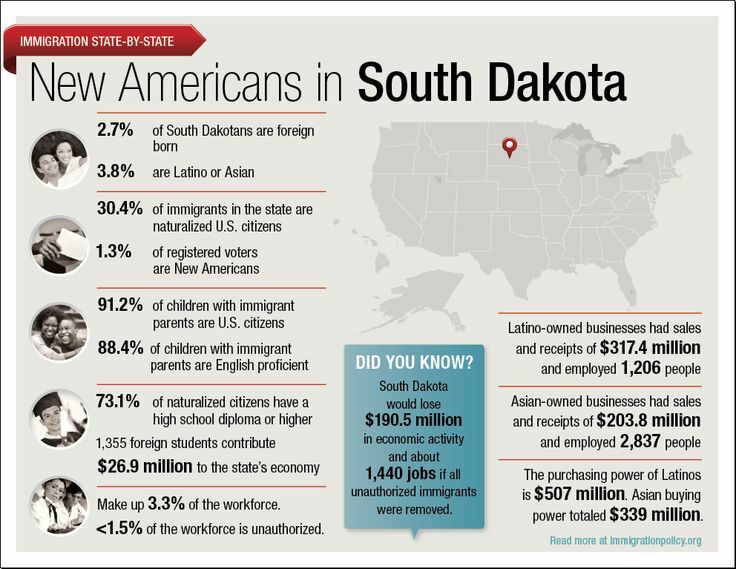 The much-discussed labor shortage brought up frequently in state government circles is one that is only magnified by making it difficult for non-English speakers to gain some sort of residential and professional toehold in South Dakota. By at least making driver's licenses accessible to them in their native tongues, as the Sioux Falls business community is promoting, our state will probably be doing itself some good on the economic development front.